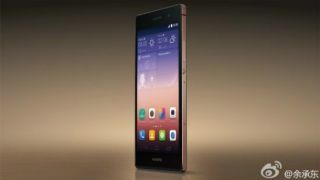 Whether or not the iPhone 6 will come with a sapphire display remains to be seen, but Huawei has jumped in ahead of Apple by outing a sapphire variant of its Ascend P7. A picture of the phone was teased by Huawei Device Chairman Yu Chengdong over Wiebo, which suggests we may see it arrive as soon as IFA 2014. The existing P7 comes with a 1.8GHz quad-core processor, 2GB of RAM, a 13MP rear camera (8MP on the front) and 16GB of internal storage. We expect the updated P7 to sport the same internals, but that sapphire display will no doubt push the price up a bit. Things have gone a bit quiet on the iPhone 6 sapphire front, suggesting that Apple's upcoming handset(s) might miss out on the improved display. If it does, Huawei may beat it to the finishing line, however we're yet to hear anything on shipping dates so hold onto your horses. But with other Chinese titan Xiaomi rumoured to be considering a sapphire phone of its own, Huawei might want to get this one out the gate as soon as possible.